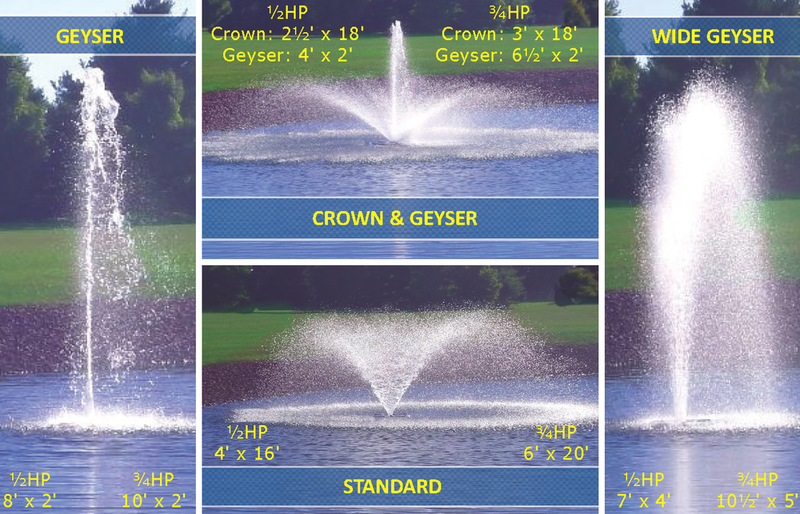 The AquaMaster Fountains (Aqua Master Fountains) Classic LE Series is the newest additions to the AquaMaster product line. This highly affordable and durable 3/4 HP AquaMaster Classic LE Fountains are constructed with high quality, corrosion resistant components and propeller technologny. The power unit propeller, debris screen, and fasteners are all made from 300 series stainless steel to provide longevity. The custom, oil cooled motor operates at an energy efficient 5 amps with 120 volts. Housed in a stainless steel canister, sealed with a stainless steel base plate and seal hub assembly for long lasting, trouble free operation. The custom, oil cooled motor operates at an energy efficient 7.5 amps at 120 volts. It sits in a stainless steel canister and sealed with a stainless steel base plate and seal hub assembly for long lasting, trouble free operation. An Aqua Lock quick disconnect is available as an option if desired. Superior Quality - The new, built to last, 3/4 HP Classic LE is constructed with high quality, corrosion resistant components utilizing propeller technology. The power unit, propeller, debris screen, and fasteners are all made in 300 series stainless steel to provide longevity.